At Verv Innovation, our team has been energizing collaborative innovation for nearly 20 years. Our mission is to inspire, visualize and design the next leap forward for your brand and your consumers. Our proven Co-Magination® approach engages consumers with our designers to deliver exciting, on-strategy and actionable solutions in durables, packaged goods and services. This powerful design method yields innovations in shorter development cycles needed in today’s fast-moving markets. There’s much more to collaborative innovation at Verv. It informs everything we do for our clients, from inspiration to innovation. It has led to unexpected, high-impact opportunities for many of the world’s most prominent brands, allowing them to build new connections with consumers. At Verv, we’ll connect with your consumers in ways you’ve never seen. Without skipping a beat, we’ll visualize solutions in form and function faster than you ever imagined. Enhancing ethnographic insight with real-time concept generation. The best time to capture the “how” and “why” of consumer behavior is when they are actively engaged in authentic product usage occasions. Our Co-Magination® Visits, often combined with in-store shopping events, link decision-making with usage dynamics and early stage concept generation. These preliminary concepts set the stage for later Co-Magination® efforts and formal concept exploration. Engaging consumers and designers in proven activities to inspire real-time concepts. Designers, researchers and client participants come together with consumers as a team to uncover fresh opportunities and unrecognized needs to fuel preliminary concepts. Activities and exercises are customized to meet objectives for learning and inspire real-time early stage solutions. Optimizing and integrating consumer preferences in a multi-station format. Our Labs support a “qual / quant” approach to design evaluation, optimization and refinement that is deeper and richer than focus group screening. Multiple stimuli stations allow us to present 2D and /or 3D concept stimuli to focus consumers on key attributes. Consumer input is then captured from multiple sources, including in-depth interviews, work sheet data and optimized sketches. Tackling a specific innovation challenge together. Fast. 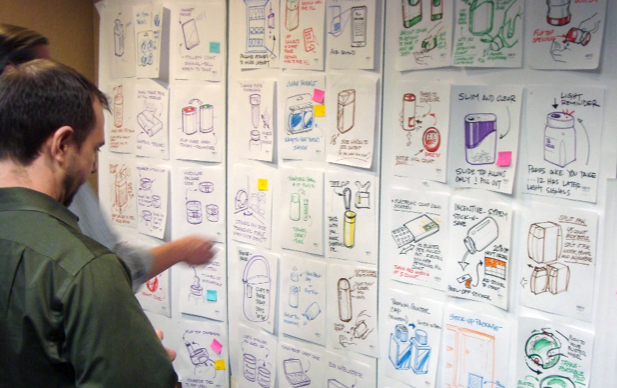 Co-Magination® Studio is a one to two day engagement at our Innovation Lab facility in NYC. Maybe you’ve identified a range of new opportunities, and you’d like to work together to visualize them for evaluation. Or, you need to kick-start an effort to determine what’s next in your category. We engage our designers with your stakeholders to leverage key insights and surface potential solutions that will move your brand forward. Our team of designers and strategists have worked together to shape opportunity for leading global brands. At Verv, Co-Magination® is coupled with independent, in-depth concept exploration to yield solutions that are on-strategy, compelling and actionable. The Verv Innovation team redefines how to create and deliver successful innovations for products that are used in homes and workplaces. By bringing consumers and clients closer to the design process, we have delivered breakout innovations for many of the world’s most prominent brands. Logos are trademarked and are used for client identification purposes only. Copyright © 2016 Verv Innovation.